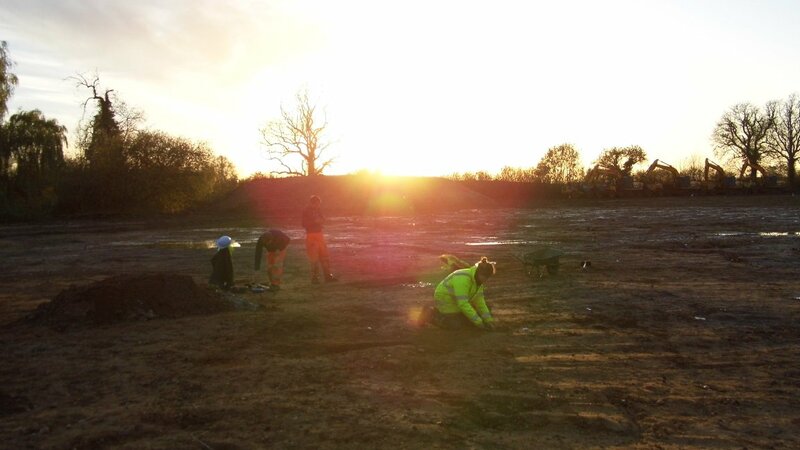 During the autumn of 2013 ULAS carried out an archaeological excavation on land at Leaders Farm, on the south-western edge of Lutterworth in Leicestershire, for Bellway Homes (East Midlands) Ltd. prior to construction of a new residential development to be known as Whittle Fields. An evaluation carried out by ULAS in 2012 identified two areas containing significant archaeological evidence dating to the Iron Age and Roman periods, consisting of a probable roundhouse, enclosures and ditches. Follow up work in 2013 saw the excavation of two large open areas (Field 1 and Field 2), 1.1ha and 0.8ha respectively, to record this activity; and the excavation of seven more trial trenches to better characterise peripheral areas of the site and to further investigate a large undated earthwork visible on Ordnance Survey maps in the site’s south-eastern corner. Despite adverse autumnal weather, which left large areas of the site extremely waterlogged or flooded and unworkable, the seven week excavation has produced good evidence for two distinct and separate landscapes. The main focus of activity was in Field 1. The eastern half of the field contained several large polygonal enclosures, the ditches defining each enclosure exhibiting a complex sequence of re-cutting suggesting that they were in use for a prolonged period of time. Activity within the enclosures was sparse, a few isolated pits, post-holes and tree-throws, but outside Enclosure A were two roundhouses (Roundhouse 1 and Roundhouse 2). A third roundhouse (Roundhouse 3), partially uncovered on the edge of the excavation, appeared to be enclosed within its own timber stockade (Enclosure C) – identified by a line of closely-spaced stake-holes found along the base of the narrow trench defining the enclosure. Whilst a fourth possible roundhouse (Roundhouse 4) was recorded beneath Enclosure B. Other fragmentary pieces of curvilinear gully recorded in Enclosure A and Enclosure B may also be the ephemeral remains of further roundhouses. Plan of the Iron Age and Roman landscape. Overall, finds from the excavation were light, but pottery from Roundhouse 1, Roundhouse 2 and some of the enclosure ditches belonged to the East Midlands scored ware tradition current from the 4th or mid-3rd century BC to the earlier 1st century BC and in view of the high proportion of scoring recorded, a date in the Late Iron Age, 1st century BC or early 1st century AD is indicated. Roman pottery is noticeably absent from features in the eastern half of Field 1. 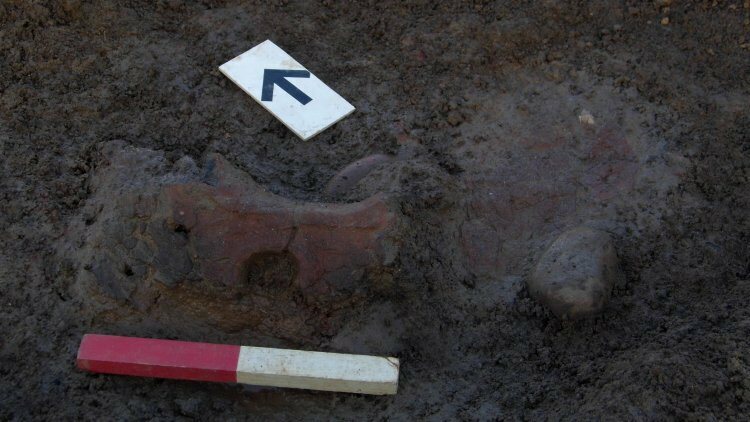 A large quantity of fired clay was also recovered from the eaves drip gullies surrounding Roundhouse 1 and Roundhouse 2. The best preserved material came from the gully of Roundhouse 1 which contained a large fragment from a perforated oven plate with other joining fragments. The function of the plate, which perhaps sat within the house before it was broken up and deposited in the gully, was to provide a flat surface for cooking and presumably a cooking pot was placed over the large central perforation. The corner of a triangular loom-weight was also found in the roundhouse gully. 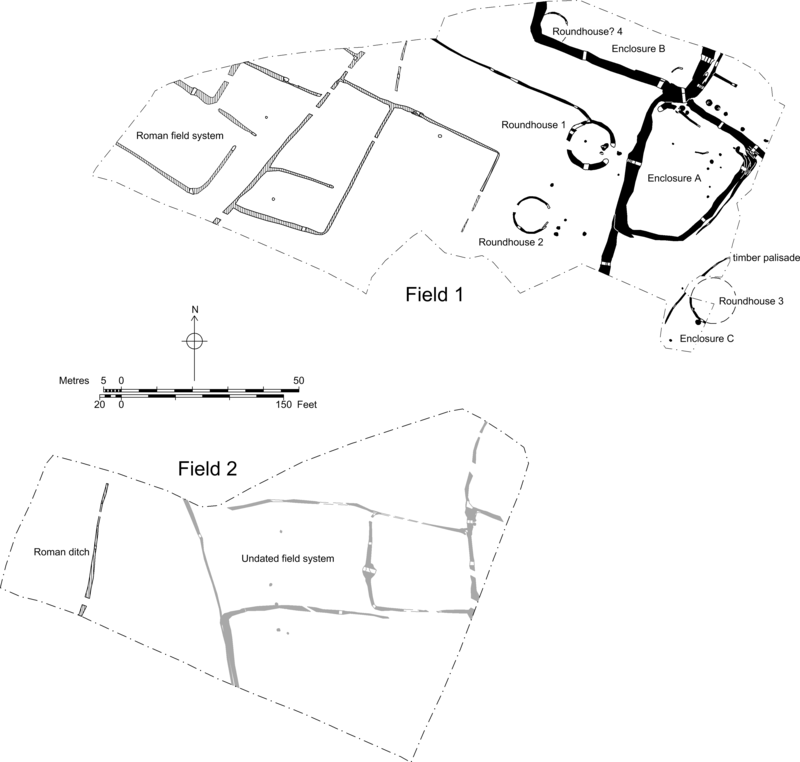 The western half of Field 1 and Field 2 were crossed by systems of rectilinear ditches but contained few other features, suggesting much of the site was covered with small enclosures or fields. Finds were scarce in these ditches, which predominantly produced Roman pottery of late 2nd or 3rd century date, with one ditch in the north-west corner of Field 1 producing an assemblage of later 3rd century or 4th century material. Many of the ditches in Field 2 remain undated. Ground conditions were not favourable for well-preserved animal bone or environmental remains. Only bones from larger mammals typically survived, with cattle, sheep and pig present on the site. Fine cut marks noted on some bones indicate that the assemblage derived from domestic waste. Soil samples from Roundhouse 1, Roundhouse 2 and some of the Roman field ditches were dominated by staple food cereal crops with a lower amount of seeds of plants from arable and disturbed ground. 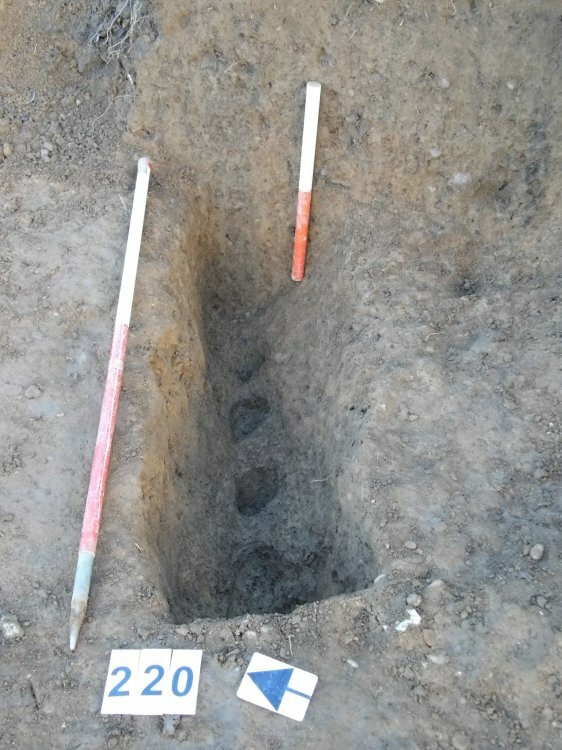 Samples taken from post-pipes at the entrance to Roundhouse 1 suggest the burning of food waste, whilst possible evidence for the parching of glume wheat (excess chaff and a large quantity of grain) was found in one of the Roman ditches in Field 1. No further archaeology was found in the additional trial trenches and the function of the large sub-rectangular enclosure in the site’s south-eastern corner remains uncertain. Trenches across the earthwork suggest that its banks were not deliberately constructed but rather a natural build-up of soil and it may relate to medieval ploughing as ridge and furrow across this part of the site appears to respect it. Considering the potential 200-300 year dating disparity between the Iron Age enclosures and the Roman field systems it seems unlikely that there was continuity in the landscape but rather two distinct and separate phases of activity on the site. Overall, the general impression given by the archaeological evidence is that the site is on the periphery of the Iron Age and Roman activity in the vicinity – the Iron Age focus most likely being to the north-east of the site and the Roman focus to the west, closer to Watling Street which is only 2km away.